To be accused of child neglect is any parent’s nightmare. It can come as a suprise, leaving you stunned and confused. You answer a knock on the door and a stern social worker is standing there, backed up by a couple of down-to-business police officers. It’s a child services official, demanding to immediately interview your child and inspect your home. As a parent, you do everything you can to keep your child safe and to provide a loving, supportive home. Yet the circumstances that can lead to allegations of child neglect and a visit from child protective services may arise almost anywhere. Among divorced parents, one parent might call child protective services to complain about the other parent – out of revenge or out of genuine concern. A child’s accident or illness can raise suspicions of child neglect among school workers. A neighbor may have different ideas about how a child should be raised. Even loud play among children may spark suspicions among neighbors who think children’s screams or rambunctious play is evidence of child neglect. When a child protective services official knocks on your door, you have no way of knowing who instigated a report or why. The first thing you need to do is remain calm. When police are involved, you are obligated to comply with their orders, but you don’t have agree to anything unless directly ordered by a police officer. 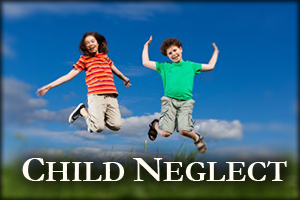 The second thing you may want to do is get a Tulsa child neglect attorney to assist you. As Tulsa family law attorneys, we’ve helped clients facing a wide range of circumstances involving allegations of child deprivation. If you believe your child is being abused by someone, or if you’re wrongly accused of depriving your child, we have the knowledge and experience to assist. Intervention by a Tulsa child protective services agency can be a traumatic event for a child. Unless your child is truly suffering in a deprived environment, even preliminary approaches by a child services worker can be confusing. If circumstances lead a social worker to take your child from your custody, the child will be housed in foster care where strangers, regardless what may be sincere concern, simply cannot provide the psychological security your child enjoys in their own home. Consider the case of a California couple who did nothing more than seek a second opinion before they let a hospital force unwanted, potentially unnecessary procedures on their infant child. The couple became suspicious when hospital workers raised their voices, and could not say what kinds of medicine they were administering. Before subjecting the child to invasive surgery, they took the child to another hospital, where doctors assured them the child was okay to go home without emergency surgery. The first hospital didn’t let matters rest. They got child services became involved and soon police were at the couples door. They weren’t there to investigate – they’d already made up their minds to take action on allegations of child neglect, based on hospital workers statements. They took the infant child from the parents. It was only after the couple retained an child neglect attorney that they regained access to their child. A child neglect attorney can investigate circumstances surrounding allegations of abuse or deprivation, and represent you in court. Outside of court, a family law attorney can help you prepare yourself for interaction with officials who may have the power to take your child out of your arms. There’s no need to go at alone. When your child’s future is at stake, you need every resource you can bring to bear to assure they get the love and support they deserve. For a free consultation with a Tulsa child neglect attorney, call the Wirth Law Office today. We offer free consultations so that you can be certain our firm has the skill and knowledge to help with your family crisis. Call the Wirth Law Office at (918) 879-1681 (or toll free at (888) Wirth-Law) or submit the question form at the top right of this page.